I’m back at it again with my favorite lifestyle model Mary Gross from the Charlotte Agenda! 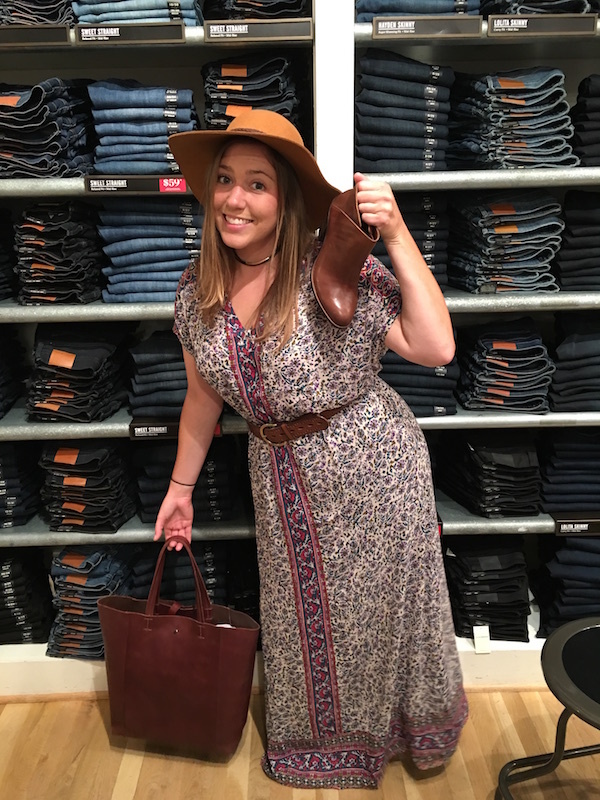 I’ve been working with Mary to slowly incorporate items into her wardrobe that are versatile but still stand the test of time. Do you have more than a few items that you have regretted buying or don’t know how to wear? 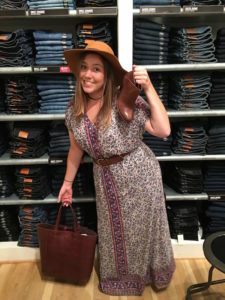 Let me show you how to buy and wear items in a variety of ways for everyday use. 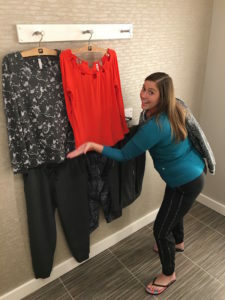 Take a lesson from the Photo Playbook below and read what Mary had to say about the garments we selected and how they fit her lifestyle and upped her fashion game! “Fabletics pants and jacket are multipurpose—more so than a legging. This season’s weekend active wear is more about the versatility of a jogger pant and jacket. Take this trend to the gym, on an afternoon errand run, or a casual evening get-together with friends. Incorporate different textures, sleeves and accessories,. Your jogger is sure to become a new favorite look. For exercise, wear a tank and sneakers. For cooler mornings, whether walking or running, the jogger pant and jacket is a good choice. For the midday look, or running errands, try a fashion sneaker and long sleeve colored top and scarf. Opt for a dressy blouse or top with sleeve or shoulder details for a trendy evening outfit. Wear the jacket by gathering the sleeves to right below the elbows. Accessorize by adding a great cuff or two and a long layered necklace. A dressy shoe bootie will complete your look. Focus on the versatility of this outfit by changing up accessories. I’ve added the belt to define Mary’s waistline and accentuate her great curves. Choose a long sweater, jean jacket, poncho or bomber/moto jacket to layer for cooler days. When selecting a scarf use a larger pattern scarf in the neckline with one of the tones from the dress. 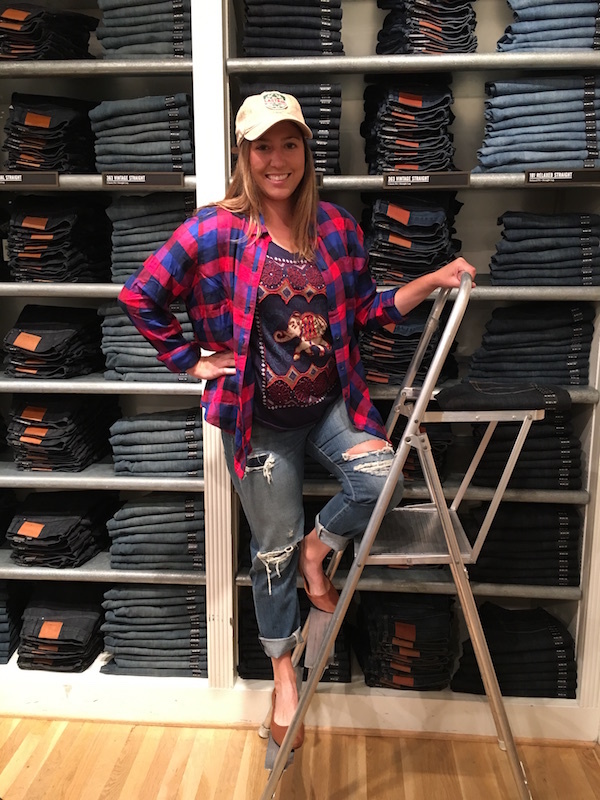 “My favorite outfit is definitely the Lucky plaid shirt and jeans. The flannel paired with the elephant tee is comfy and cute. 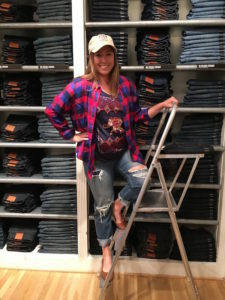 Step into comfort by trying a boyfriend jean, graphic tee and flannel. Size down in a boyfriend jean. The waist should be fitted and the thigh region will be a bit fuller. Take notice to where the holes and tears are located on the jean to make sure they are not too distracting. 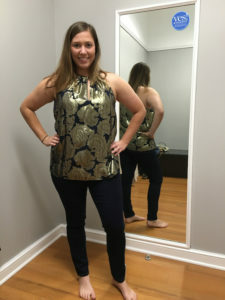 I know Mary loves a touch of glitter, so I found a top that could transition from a night out with a skinny black jean, or for any upcoming holiday occasion, whether an office party or a family gathering. 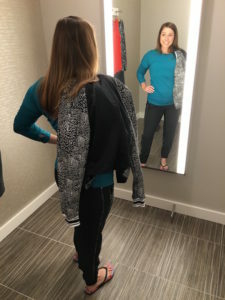 When selecting a holiday top, jacket, dress or skirt, focus on non-trendy silhouettes with patterns and textures that you will want to wear for several years to justify the cost per wearing. Versatile in color, fabric and shape , this Michael Kors top is best worn with a structured tuxedo jacket with a fitted leather or suede bottom and legging and an over-the-knee boot. A basic pencil skirt also will work. 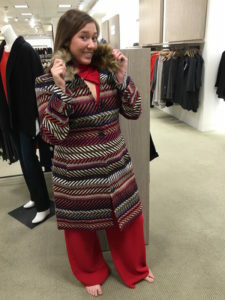 With my fashion blessing, Mary and I agreed that she could up her game with a classic but colorful dress coat. The slimming horizontal wool coat with a detachable faux fur collar is the perfect addition to Mary’s wardrobe of basics. Whether Mary wears it with jeans or for dress, this show-stopper coat is an item she will have for years to come. If you choose to stray from basic color for a more bold color or pattern coat, be sure to select a classic body style and color range that you won’t tire of. If you already have the LBD in your closet then another wonderful wardrobe builder is a little lace lined, neutral or flesh tone dress. Layer a neutral lace dress with a structured basic blazer, or leather or military style jacket with an over-the-knee boot, chunky heel or bootie. Add a statement necklace in metallic to take this fresh look well into the holiday season. 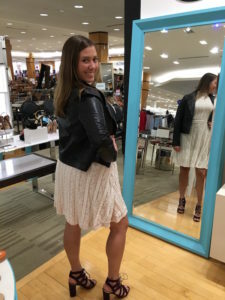 Stepping out of your LBD will never feel so good! Special thanks to Mary Gross, as my time with her is always a blast! Like what you see? Please share! And, if you have questions about how you can up your fashion game, call me or send an email.